A second European green crab has been found in Puget Sound, this one in Padilla Bay — about 30 miles southeast of where the first one was discovered about three weeks ago. 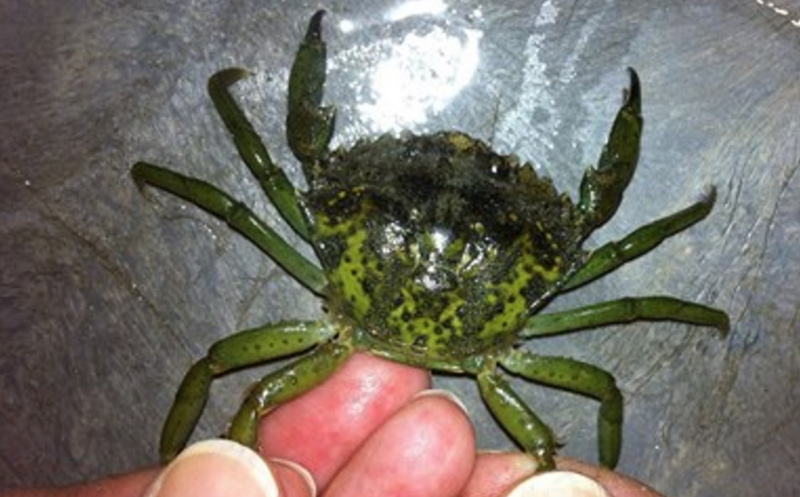 A second European green crab has been found in Puget Sound, this one in Padilla Bay. Green crabs are an invasive species known to devour a variety of native species and alter habitats where they have become established. Keeping green crabs out of Puget Sound has been a goal of state officials for years. After the first green crab was caught in a volunteer trapping program three weeks ago, experts mounted an intensive trapping effort to see if other green crabs were in the area around Westcott Bay in the San Juan Islands. (Water Ways, Sept. 3). No live crabs were found, but one cast-off shell (molt) was discovered nearby (Water Ways, Sept. 15). The second green crab was found by Glen Alexander of the Padilla Bay National Estuarine Research Reserve while overturning rocks with a group of students. The latest find is a young female crab, 34 millimeters across, which may have grown from a larva dispersed last winter. A second rapid-response effort will get underway Monday with more traps being deployed over a larger area than last time. The goal is to locate any crabs that may have made a home in the area and determine where the crabs might be gaining a foothold. Learn how to how to identify green crab. Check out the Crab Team webpage at wsg.washington.edu/crabteam or Facebook and Twitter @WAGreenCrab. Take a photo and report sightings to the WSG Crab team at crabteam@uw.edu. Shellfish collected in one location should never be released or “wet stored” in another location unless authorized by WDFW. Clean, drain and dry recreational gear or other materials after beach visits. If you haven’t seen it, you may want to review a series I wrote on invasive species for the Encyclopedia of Puget Sound, including a story about green crabs and the volunteer monitoring program. So, we hear about what not to do and how to report green crabs. But what do we do with the actual crab? I believe Jeff Adams described the appropriate response while answering a similar question after the first crab was found. See Water Ways, Sept. 3. Thank you for the question; I’m sure others are interested in this.